Newly minted Arcata Police Chief Brian Ahearn was all smiles and excitement when he sat down with the Journal Nov. 15, his uniform pressed and new, less than a week into the job. The 30-year law enforcement veteran from the San Diego Police Department is taking over a department that's been embroiled in no small amount of turmoil over the last couple of years. With Arcata already in the midst of a spike in violent crime, the April 15, 2017, stabbing death of a 19-year-old Humboldt State University student at an off-campus party has proven a flash point for the department and the city. In the 18 or so months since David Josiah Lawson's death, APD has seen its chief abruptly resign, along with a retired FBI agent brought in to consult on the case, and been threatened with lawsuits from both Lawson's family and that of the man suspected of his killing, with both sides alleging APD botched its investigation. In the background of all this, a steady stream of students and community members of color have stepped forward to say they don't feel safe in Arcata. 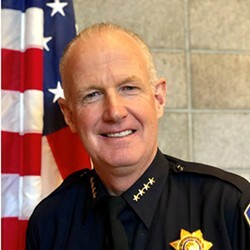 Ahearn enters the fold just as APD has completed its investigation into Lawson's death and turned it over to the Humboldt County District Attorney's Office, with interim APD Chief Richard Ehle having pushed it forward with the help of an influx of resources from the city. It's a pivotal moment in Arcata and how the city navigates the months ahead will have a lot to do with how Ahearn settles into his new role. When the Journal caught up with Ahearn, we asked him five questions we hoped will give some insight into how he will approach the months to come. North Coast Journal: How have your first few days on the job been? Brian Ahearn: Inspiring. Informative. Very educational. And fun. It's exciting and I'm learning a lot. I'm trying to do a lot more listening than talking. I've met the officers and professional staff — everyone's been very welcoming. And I've been out in the community quite a bit and everyone is just very welcoming. They want to share information. They love their police department and they're happy to have a new chief, although they are very grateful for the work Interim Chief Rick Ehle has done — and the entire department has been doing — during the transition. NCJ: At this point, what do you see as Arcata's biggest public safety challenges? Ahearn: Well, I think there are a few. First of all, violent crime is something that we have to continue to strategize to reduce the opportunity for violence to occur. I think you know there have been some recent developments on two (California Bureau of Alcohol Beverage Control) licenses of the establishments on the perimeter there of the plaza. It's important that ABC licensees utilize their licenses in the manner they're supposed to be utilized. Otherwise, there could be potential problems that the police department's going to have to deal with, whether it's crime or quality of life issues. Homelessness is something that seems to be on everyone's radar and the police department is certainly part of the solution. The solution is much broader than just law enforcement but we understand we have a role to play and we will continue to be at the decision-making table to help the region, to help our city do what it can to find transitional housing, job opportunities and, for those who are struggling with addiction, treatment. One of the other things I see as really important right now is to make sure that we have a really healthy relationship with the campus of Humboldt State, the students, the administration. I just want to make sure that we are restoring trust in every community, in every neighborhood, and I've been so impressed with the employees here at the police department. They're committed, they have so much pride in Arcata and the uniform and the patch that they wear and they want to continue to provide exceptional customer service. That will continue to pay huge dividends in building relationships and restoring that trust. NCJ: We reported earlier this month that Arcata seems to be in the midst of a pretty significant violent crime spike. The city has recorded eight homicides since the beginning of 2013 after seeing just five in the 22 years prior. Similarly, aggravated assaults are up 25 percent and violent crime as a whole is up 31 percent. What can APD do to address this? Ahearn: We've already started. The first thing we have to do, and we're doing it, is we have to understand the previous cases. We have to biopsy those cases to really understand the crimes themselves: What's precipitating them? What are the causal factors? What's the incident that results in the crime itself? What's the point where the crime is committed? How many people are involved? Who's involved? What kinds of weapons are being used? Where are they happening? When are they happening? ... All these things are really important to any law enforcement agency to biopsy these cases. Our second branch in this solution is, how do we direct our resources in a way that's going to help impact and reduce the potential for violence to occur? That's in the data you compile from going through each case really painstakingly to really understand how the crime occurred. I think having the community's perspective and input is already really important. What we're doing is establishing relationships with business owners, people who work in areas that are impacted by violence and certainly those who live in areas impacted by violence. I want to understand what their perspective is. You know, the reports might say one thing, the data may say another and certainly our officers have a lot of institutional knowledge, but in order for us to really develop long-term solutions to steer us away from potential violence, people who live and work in the area have a lot of information that we have to tap into. So I see this as a multi-pronged approach. We're going to use community policing, problem solving and our uniformed assets to reduce this potential for violence to continue to occur. NCJ: In the wake of David Josiah Lawson's killing in April of 2017, a lot of community members of color have stepped forward to say they don't feel safe in Humboldt County, generally, and Arcata, more specifically. What can the department do to reach out to these community members to make sure both that they are protected here and that they feel protected here? Ahearn: There's a number of things that we can do — and that I think we have been doing — but if it's not enough, then we need to do more. First of all, it's really important for our police department here in Arcata to have a very healthy and strong working relationship with the campus community, not only the HSU police department but the administrators, the professors, anyone who is affiliated with the campus. Providing access to the students is critical. Regardless of what data may say, what other people may say, the fact that someone has the perception that there's a division between the student body and the Arcata Police Department, that's something we have to repair. We're in that process right now. ... We have a lot of repairing to do. We do that by providing our time, our accessibility, by communicating and collaborating with the students and by holding events and bringing them here to the police department, going out into the community to meet with them. My first community walk was in Valley West. My next community walk is going to be in the North Town area because I understand there are a lot of students who live there off campus. I'll be knocking on doors, handing out my business card and doing two things: First of all, ensuring them that we're public servants, which includes students, and second really opening the lines of communication and getting to know the students, not only on a professional level but on a personal level, too. I was out at Valley West the other day and as someone drove by, they yelled out, 'Hey, chief, how are you doing?' I was on the plaza last Friday and an HSU student walked by and she volunteered to take a photo of me with two other people and then I asked her, 'Hey, can I get a selfie with you?' And she was just so excited that someone in uniform took that much interest in her. But I realize it's going to take a lot of work. We're going to roll up our sleeves. The thing I'm truly inspired by is every briefing I've gone to here within the police department, the officers and the sergeants and the lieutenants all want the same thing. I think they've been working toward that, to have that relationship and to rebuild these connections, but I think coming in with having some experience in that regard, I feel really good about what we can do in the next days, weeks and months ahead to restore that trust. I'll finish with this, I talked a little bit about events. We're going to have an open house here on Saturday, Dec. 8. It's going to be from 9 a.m. to 12 p.m. We're going to invite the students. We're going to have some food here, tours of the police department. I'm trying to figure out a stress-release activity for the students because they'll have finals week coming up the following week, which is one of the reasons we wanted to have it on Dec. 8, because I wanted to make sure they have a chance to decompress a bit before they have to take their finals and I wanted to have an audience with them before they go home for the holidays. But part of it, too, is we're going to have a recruiting fair so any student, or any community member, who has an interest in joining the Arcata Police Department as a career will have the opportunity to at least get started by applying. But I see that as a step toward humanizing ourselves to them and letting them know that we're not perfect, but our goal is to work in conjunction with the campus and UPD to create an environment so they're safe, so they can thrive ... in school. NCJ: What has been your biggest surprise about Humboldt County so far? Ahearn: I won't say it's a surprise but I will say the thing that has struck me the most is the level of cooperation and collaboration between all the different government agencies — social service agencies — in the area. Not just law enforcement. The Arcata city government, our mayor and vice mayor and city council members, our city manager, all our department directors, everyone is really working well together with our county counterparts, other neighboring cities in the region, our institutions of higher learning. Everyone kind of has the same goals and I think that pooling our resources together gives us a better chance of continuing to make progress on some of these issues that are impacting our community. It's just nice to know that everyone is putting their egos aside on behalf of doing what's best for our communities. I'm just excited to be a part of that.